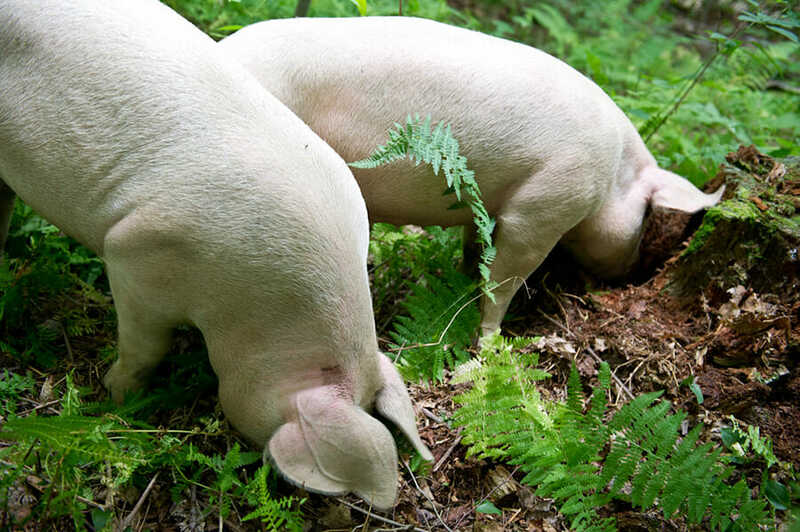 Schulyer and Colby Gail raise pigs in the most natural way possible at Climbing Tree Farm in New Lebanon, New York. Schuyler Gail may have been a vegetarian until two years ago, but today she’s known for her pork. 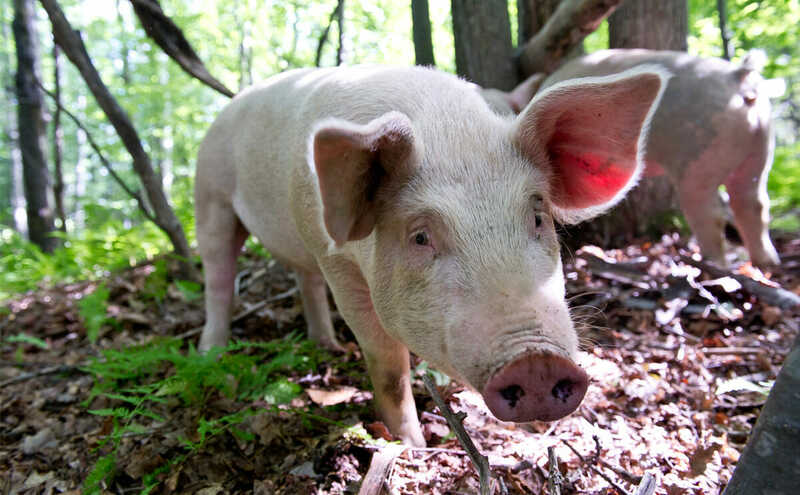 Along with her husband, Colby, Schulyer raises pigs ”“ as well as chickens and sheep — at Climbing Tree Farm, a 390-acre farm in New Lebanon, New York. And it’s not just any pork. While much of the appeal of “natural” meat, at least as far as advertising goes, is to return to the way Americans raised animals 60 years ago, on small farms with rusty tractors and pig pens, the Gails are attempting something more revolutionary: To raise pigs the way our peasant ancestors did — freely, and in the woods. This means that the Gails’ pigs have an uncommon diet. 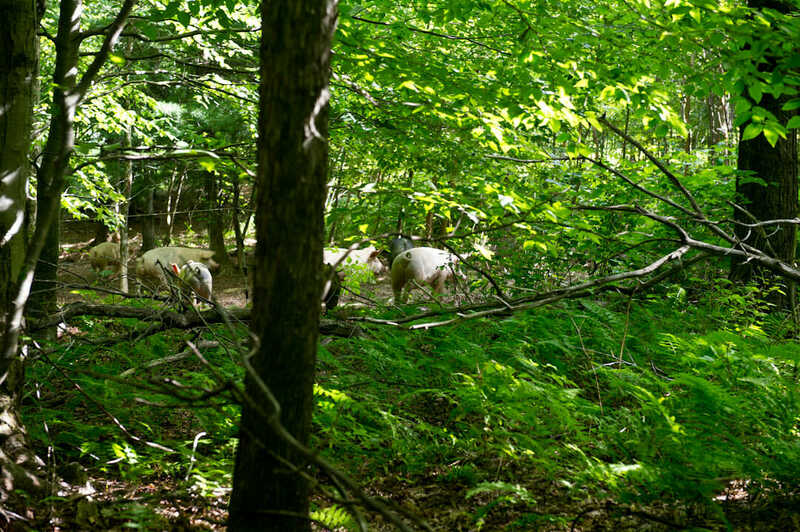 Most of their food is foraged from the land around them. The pigs are kept in small groups in pens between a quarter of an acre and 2 acres in size, rotating from pen to pen depending on the amount of food available. Instinctual pork is a relatively new trend. Farmer Joel Salatin, profiled in Michael Pollan in The Omnivores Dilemma, raises pigs on his Shenandoah Valley farm this way. Animal scientist Temple Grandin has also done work in this area. But trying to go out and buy pork for dinner and know it’s been raised like this is impossible for the average consumer. But now, thanks to farmers like the Gails, this is changing. About half of the Gails’ pigs’ diet consists of plants growing around them. Another quarter comes from supplemental crates of expired milk, buttermilk, and whey given to the farmers from local dairies — giving the goods away is cheaper than throwing them out. This means that the Gails get 300 gallons of whey every ten days and 100 to 200 gallons of out-of-date milk a week to feed the 50 to 75 pigs they keep at a time. (They slaughter 1 to 3 a week.) The final quarter of the pigs’ diet comes grain. The Gails are using some commercial grain now, but plan to plant more foraging crops in future years – turnips, pumpkins and rye – and wean the pigs from feed altogether. And this sort of diet does change the taste of the pork. “What you get is a different quality of fat,” Stine says. Pigs raised instinctually have access to antioxidants and omega-3 fatty acids, which are good for fighting disease and maintaining healthy metabolism. This is rare in commercially-raised pork. Because the Climbing Tree Farm pigs eat local barley, old pumpkins at Halloween, fallen apples from local orchards, the flavor of the pork changes, too ”“ seasonally. “The meat tastes different depending on what the pigs ate,” says Schuyler. Colby, 33, and Schuyler, 31, met while teenagers at summer camp in the Pacific Northwest. 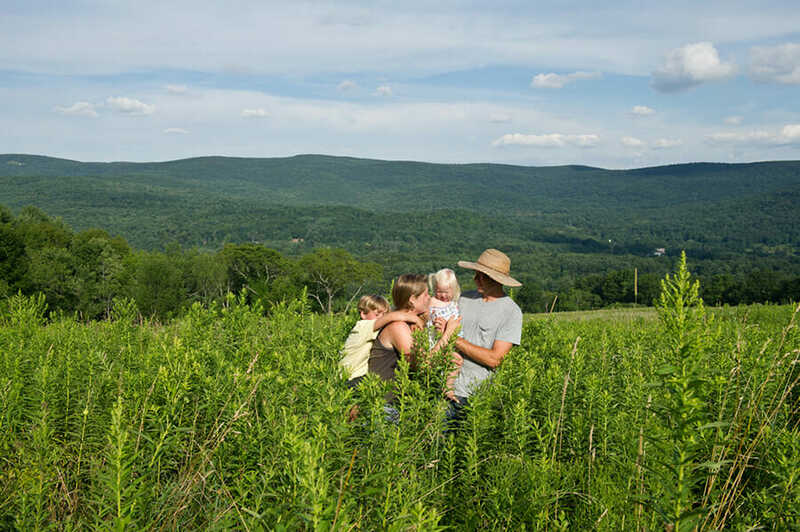 Longtime gardeners, they first began farming with a few sheep part-time on Schuyler’s grandmother’s farm in Berlin, New York in 2005. 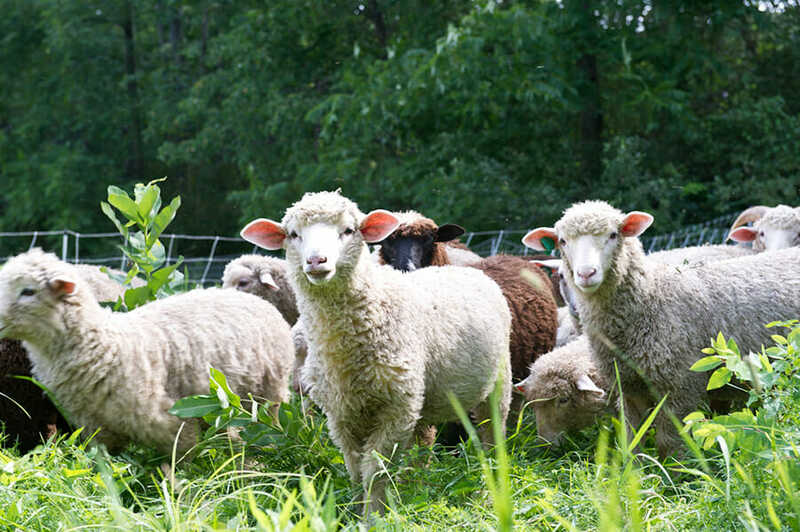 But once the animals started to breed and Colby and Schuyler were producing more lamb than they needed, they branched out into full time farming. While the flavor of this kind of pork is unrivaled, how affordable is it for the farmers? The upfront costs are high, particularly because the farmer needs to have a lot of land in order to move the animals every few days so the pigs can forage food. As Colby explains, however, the quality of the land doesn’t matter much. Any property will do. Farmers also don’t need much infrastructure. “We think that this is a better way to go about it than, you know, taking out a mortgage to build big barns like others do it,” Schuyler says. The Gails have worked hard to cut costs. They have no barn and no tractor. In the winter they often carry food and water to the animals in an old canoe they attach to a 4-wheeler, “like an old fashioned bob sled,” Schuyler says. They have made movable shelters for their animals out of pallets and old above-ground pool siding. They use a teepee, which they bought off of Craigslist, to store feed. The pigs eat from feed troughs made from PVC piping that Colby found discarded on a construction site. Schulyer and Colby Gail with their two children. This doesn’t mean that the Gails are opposed to progress. Indeed, the success of this endeavor is made possible through technology. Changes in electric fencing equipment make it possible for pigs to live more naturally, roam more. Inexpensive plastic fencing is easy to put down and take up every few days. It’s cheaper and much more efficient to put down than normal pens. Colby and Schuyler don’t need to dig holes to keep the pigs in one pen. They just rotate the pigs around every few days using plastic fencing that retails for about 30 cents a foot. Schulyer became a vegetarian as a kid because she thought animal cruelty was wrong. Despite the fact that she started eating meat again two years ago, she still believes she’s avoiding being cruel to her animals.